Senate Republicans approved a rare change in the chamber’s rules slashing the debate time for many of President Donald Trump’s nominees, putting them on a fast-track to confirmation. The GOP change made Wednesday afternoon with the opposition of all but one Democrat and two Republicans, cuts the debate time for nominees from a mandatory 30 hours to just two hours for nominees to the lower court and executive branch. It’s a move sure to please the GOP base which has, for years, prioritized judicial nominees. The debate turned remarkably bitter Wednesday between the Senate’s two leaders. Sen. McConnell, who is up for re-election in 2020, said the chamber, in which Republicans hold a 53-seat majority – seven votes shy of what is needed to forcefully end a filibuster – was forced to hold 128 votes to shut off debate on Trump’s nominees. “That’s more than five times the previous six presidents combined,” said the GOP leader, who has called confirming judges his number one priority, particularly in a chamber often stymied by partisanship. His Democratic counterpart, Sen. Charles Schumer, D-NY, took to the floor, shushing the chamber, and blistered his colleagues across the aisle, accusing them of a grander, more “cynical strategy” that would “grease the conveyor belt” for controversial nominees. (Zach Gibson/Getty Images) Senate Majority Leader Mitch McConnell speaks during a news conference following a weekly policy luncheon, April 2, 2019, in Washington, DC. A red-faced, animated McConnell rose to defend himself against Schumer’s attacks, his second floor speech of the day. The GOP leader recalled Democrats in a “panic” after President George W. Bush was elected after a bruising campaign and vote recount in 2000. “The alarms went off. 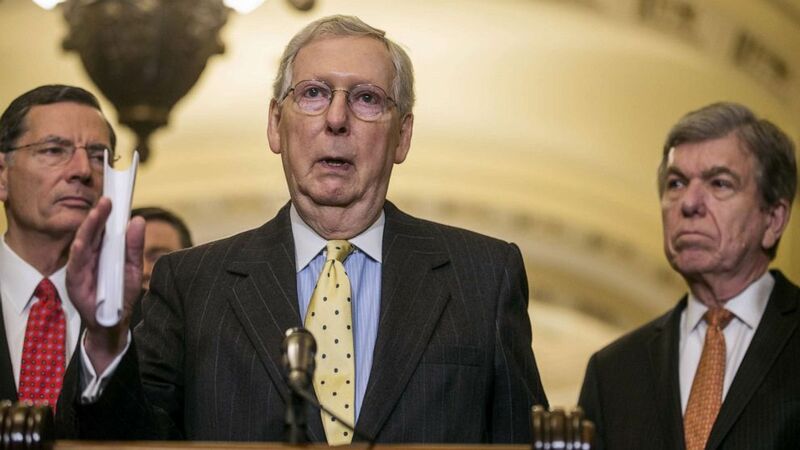 They’re going to appoint a bunch of crazy right wingers to the court,” McConnell shot back, recalling Democrats blocking the nomination of Miguel Estrada to the circuit court of appeals, a stinging defeat for Republicans. “He started this whole thing that we’ve been wrestling with since 2003,” McConnell exclaimed, pointing at Schumer. GOP Sens. Susan Collins of Maine and Utah’s Mike Lee voted against the rules change. Moderate Sen. Joe Manchin of West Virginia was the lone Democrat to vote with the majority. “I oppose changing the post-cloture time rule. I certainly oppose breaking the rules of the Senate to do so. The current rules can work for the American people; they simply require us to do the same,” Sen. Lee said. One author of the current rules change tried to take the partisanship out of the debate. “Republicans believe that regardless of who the president is, he or she ought to be able to hire their own staff,” said Sen. James Lankford, R-Oklahoma, just before the vote. Sen. Roy Blunt, R-Missouri, who worked with Lankford, assured his colleagues that Supreme Court justices and Cabinet secretaries would be exempt from the change. But, one Democrat, Sen. Michael Bennet of Colorado, who may join the growing field vying for the chance to take on the President in 2020, said that Republicans must have forgotten about GOP obstruction in the Obama Administration. Despite the rancor, there was broad agreement on one McConnell assurance. The GOP leader told members that there would be no change in the legislative filibuster, this despite prodding from President Trump to do just that. Hanford nuclear workers to receive protections in settlement with Energy Dept.